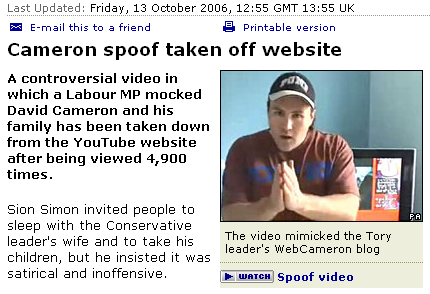 The BBC are reporting that Cameron spoof taken off website, however on the same page is a link to their media player which still shows the clip. 16:07 Edit: Try this? (Can’t confirm if it’ll work as the firewall at work won’t let me try). 16:21 Edit: Does work for the time being with Window Media Player selected as your prefered player. Obviously the user realised it was bad for him politically. Sadly, for him, it is out there somewhere and people will have copies of it and it will countinue to haunyt him, especially come next election time.